Preparing for emergencies is not new. You take steps to stay safe every day. For instance, you wear your seatbelt in the car, just in case you are in an accident. You make sure your children wear helmets when they ride their bicycles. Your great-grandparents probably had extra supplies in their home, including soap and shampoo in bathroom closets, onions and potatoes stored in the cellar, and canned goods on pantry shelves. They understood the value and wisdom of having a little extra on hand for emergencies. New Hampshire has its share of emergencies, including ice storms, tornadoes, floods, and power outages. Refer to the sections below for state, federal, and general emergency preparedness resources to help you and your family stay safe and be prepared for any emergency. 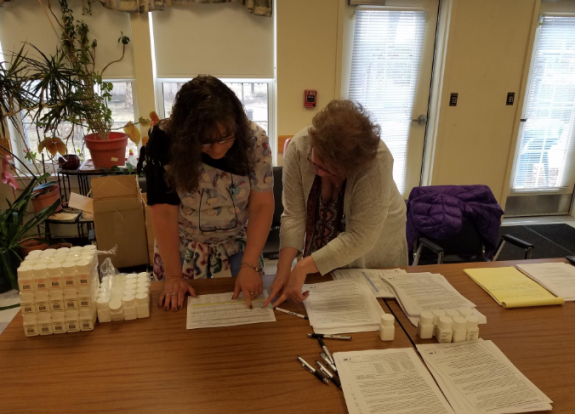 On April 15, 2019, the Grafton County Nursing Home participated in a closed POD (point-of-dispensing) Exercise. Testing the facility's emergency dispensing plan in the event of a public health incident that would require the provision of critical medications to clients and staff members, (left) "clients" get checked in at the registration table to recieve their medicine, while (right) nursing staff review the CDC's (Center for Disease Control and Prevention) dispensing guidance for Medical Counter Measures. 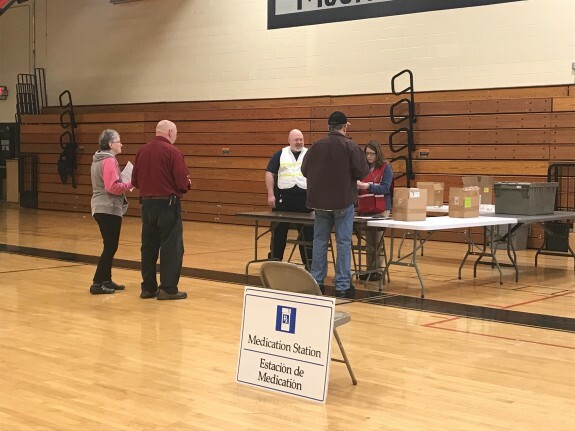 On April 13, 2019, the City of Berlin, including local and state partners, participated in a POD (point-of-dispensing) Exercise at the region's designated POD, located at Berlin High School, to test the Berlin region's emergency dispensing plan in the event of a public health incident that would require the provision of critical medications to area residents. 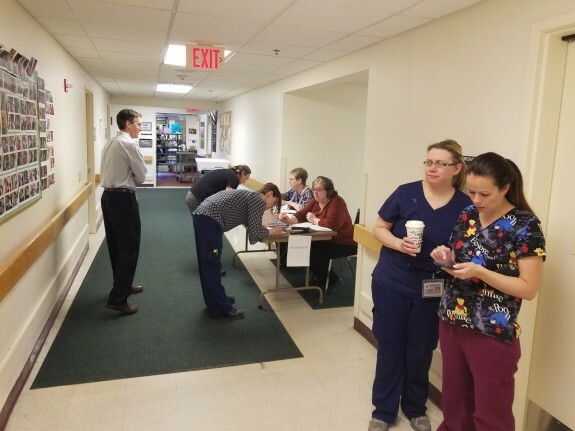 During the drill, (left to right) from registration to receiving medical counter measures, and finally exiting, volunteers from the community showed up to simulate a bio-terrorism attack requiring the community to report to the POD for antibiotics. 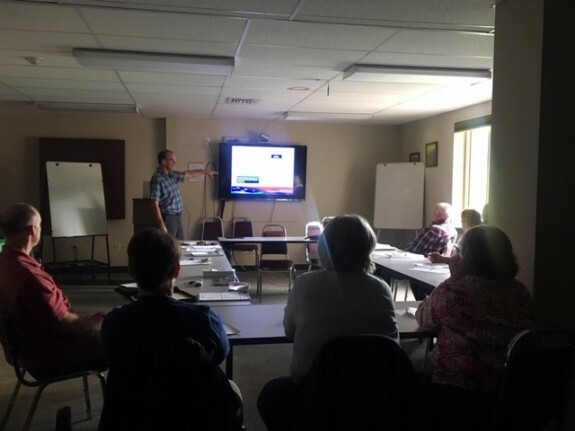 On March 18th, 2019, North Country Health Consortium Public Health Emergency Preparedness (PHEP) Coordinator, Jim Richardson, presented to staff of Tri-County Community Action (TCCAP) Head Start at their quarterly All-Staff Meeting. 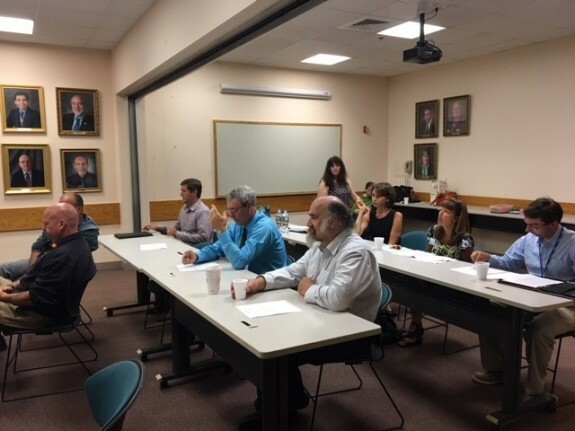 The discussion centered around the State of NH Child Care Emergency Preparedness Licensing requirement for Licensed Day Care Providers, with topics covered including, developing a robust Emergency Operations Plan and conducting Emergency Drills and Exercises. 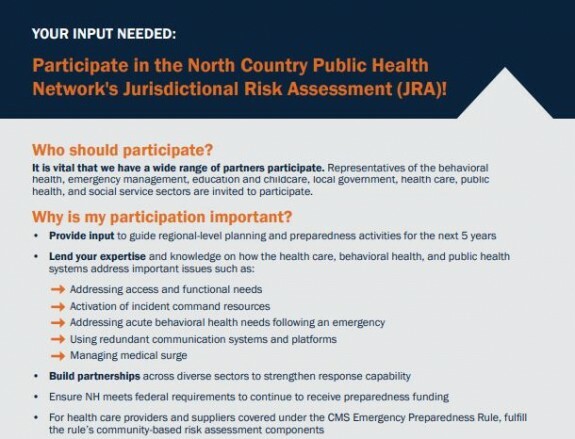 On October 11th, 2018, North Country Health Consortium's Public Health Emergency Prepared (PHEP) Coordinator, Jim Richardson, attended the Granite State Healthcare Coalition training conference in Plymouth, NH. 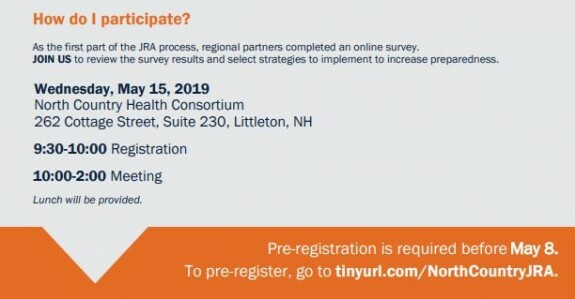 The conference covered topics including, developing training and exercises for “long-term care agencies” to help ensure they meet the requirements of the Centers for Medicare and Medicaid Services Emergency Preparedness Rule. 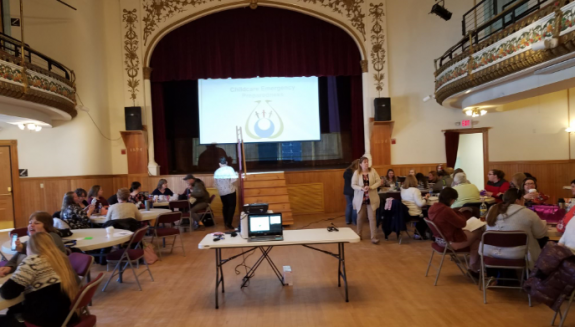 Attendees from the North Country included, Coos County Nursing Home and Saint Vincent de Paul Rehabilitation and Nursing Center in Berlin. 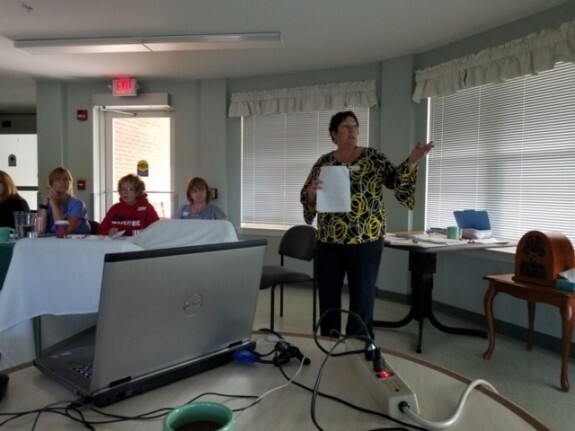 On Friday, September 28th agency representatives met at Coos County Nursing Hospital in West Stewartstown, NH, for a workshop aimed at improving the facility’s Emergency Plan. 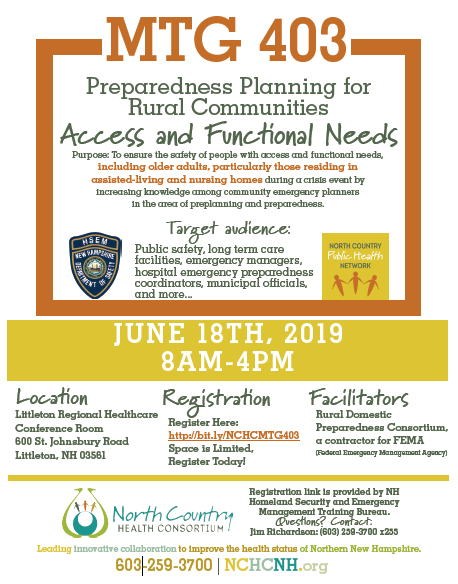 Facilitated by the North Country Health Consortium’s Public Health Emergency Preparedness (PHEP) Coordinator, Jim Richardson, the workshop and tabletop exercise, which had participants working through a given scenario to improve the facility’s Emergency Plan— met the requirements for all nursing homes in the State of NH through the newly-enacted Emergency Management regulations from the Centers for Medicaid and Medicare Services (CMS). 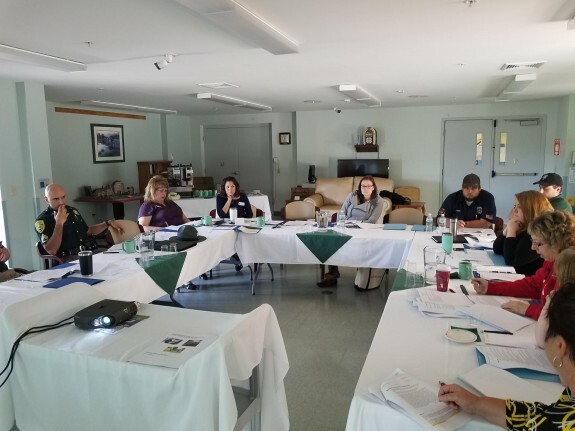 Participating agencies included staff from the Coos County Nursing Hospital, Coos County Correctional Facility, NH State Police, Upper Connecticut Valley Hospital, Bellows Falls Fire Department, 45th Parallel EMS, and the North Country Health Consortium. 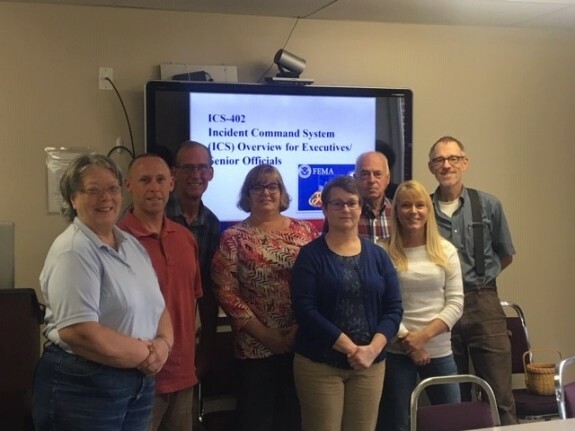 On September 26, 2018, the North Country Health Consortium's Public Health Emergency Prepared (PHEP) Coordinator, Jim Richardson, delivered the FEMA (Federal Emergency Management Agency) training, ICS 402, before a group of North Country PHN members and agency partners. 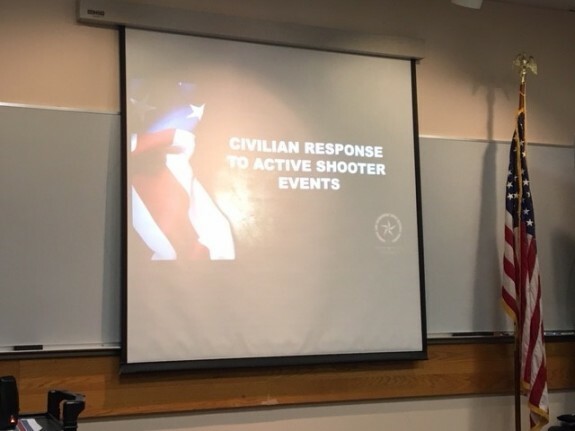 The purpose of this training is to familiarize executive and senior officials, including elected officials, city/county managers, and agency administrators, with Incident Command System (ICS), which refers to the combination of procedures, personnel, facilities, equipment, and communication operating within a common organization structure, designed to aid in the management of on-scene resources during incidents. 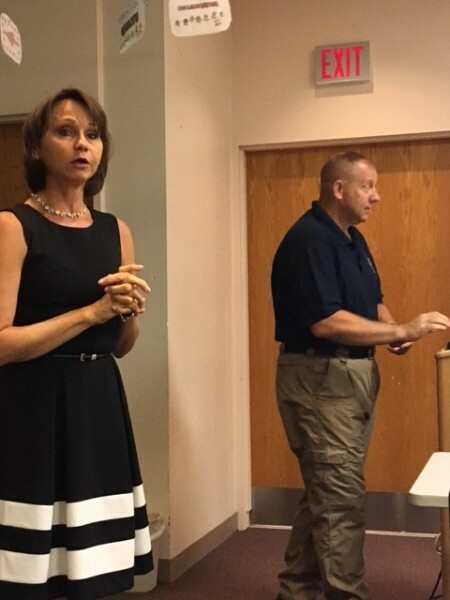 On July 16, 2018, the North Country Public Health Emergency Preparedness Regional Coordinating Committee sponsored the “Civilian Response to Active Shooter Events” (CRASE) Training. Generously facilitated by Lt. Tim Godin of the Berlin Police Department at the Androscoggin Valley Hospital (AVH), this valuable and timely training was attended by staff from AVH, School Administrative Unit (SAU) 20, Weeks Medical Center, Coos County Family Health Services, as well as North Country Health Consortium. ReadyNH.gov is New Hampshire's official source for information during state emergencies. 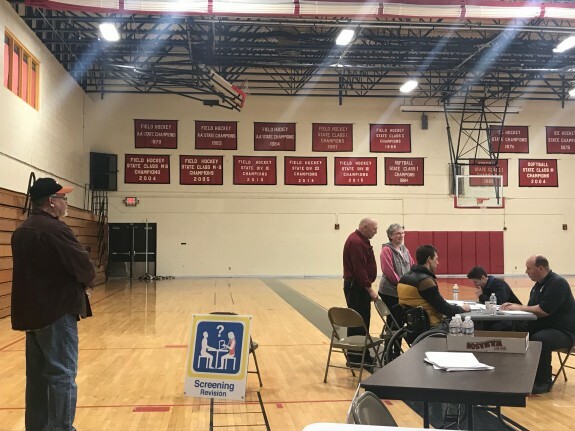 New Hampshire Department of Safety's Homeland Security and Emergency Management coordinates the State’s response to major disasters (e.g. natural disasters, such as hurricanes, floods and severe winter storms), human-caused disasters (e.g. nuclear power plant accidents or chemical spills), and planning and training to prepare for terrorist attacks. Ready.gov was designed to educate and empower the American people to prepare for, respond to and mitigate emergencies, including natural and man-made disasters. 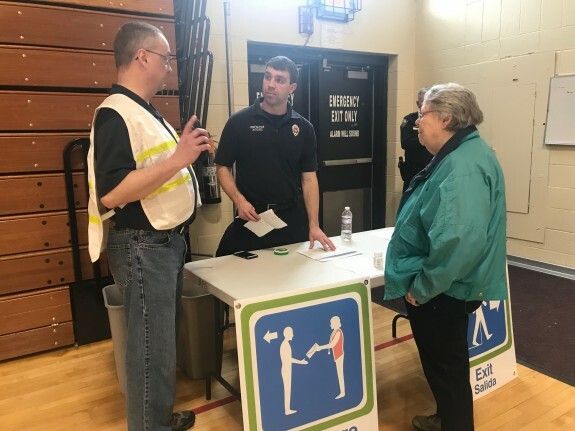 The goal of the Ready campaign is to promote preparedness through public involvement. Sign up for NH Alerts to receive public safety notices issued by the State of New Hampshire and severe weather warnings directly from the National Weather Service. 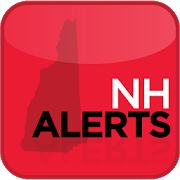 NH residents are asked to download the NH Alerts mobile application from the App Store and Google Play to receive emergency and severe weather notifications from state officials. PreparednessGuide.org is a go-to resource for all things related to disaster preparedness, including information about how to be prepared, whether for a fire, extended power outage, or serious natural disaster, including hurricane, earthquake or tornado.